The following MUJITSU Shakuhachi by Ken LaCosse are in stock and available for purchase. Feel free to contact me with any questions. 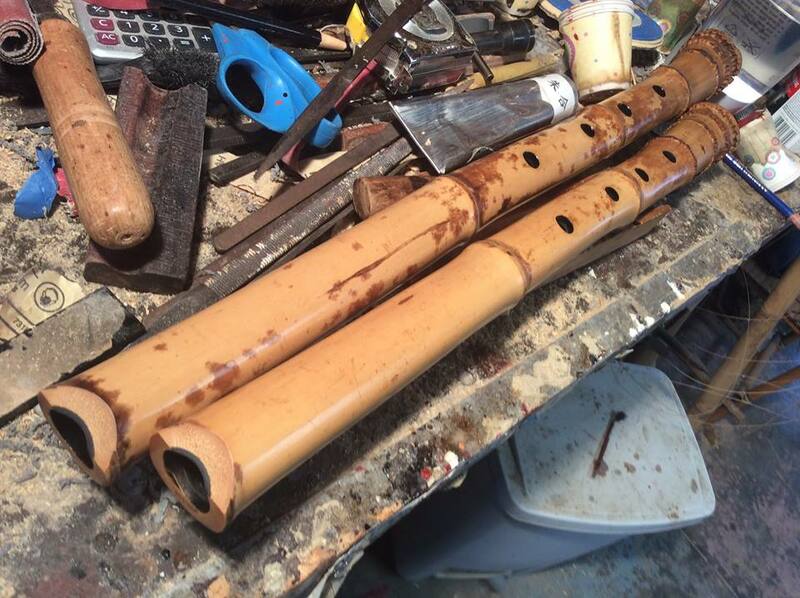 I have a number of shakuhachi going in the shop constantly. Many are sold before they make it to this page. If you don't find what you are looking for here I might be working on it now! You can contact me here. The flutes on this page are the finest that I have available. 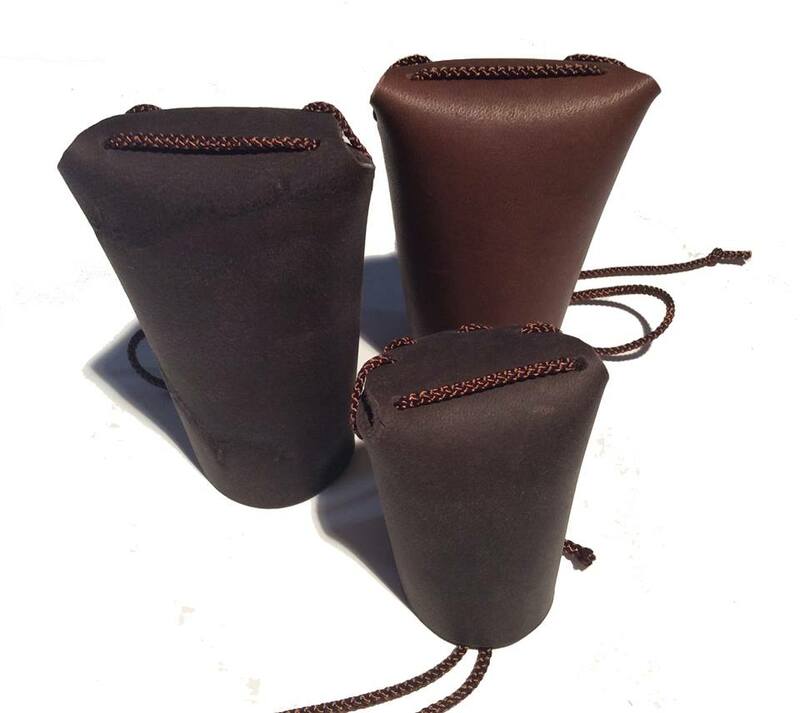 They are made from Japanese Madake culms of some of the highest quality obtainable. Although each flute has a distinct tonal personality, the overall tonal quality that characterizes Mujitsu Jinashi Shakuhachi is a glowing, fluid playability. 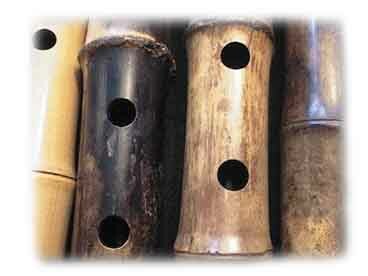 The Taimu Shakuhachi are characterized by their breathy, penetrating glow. 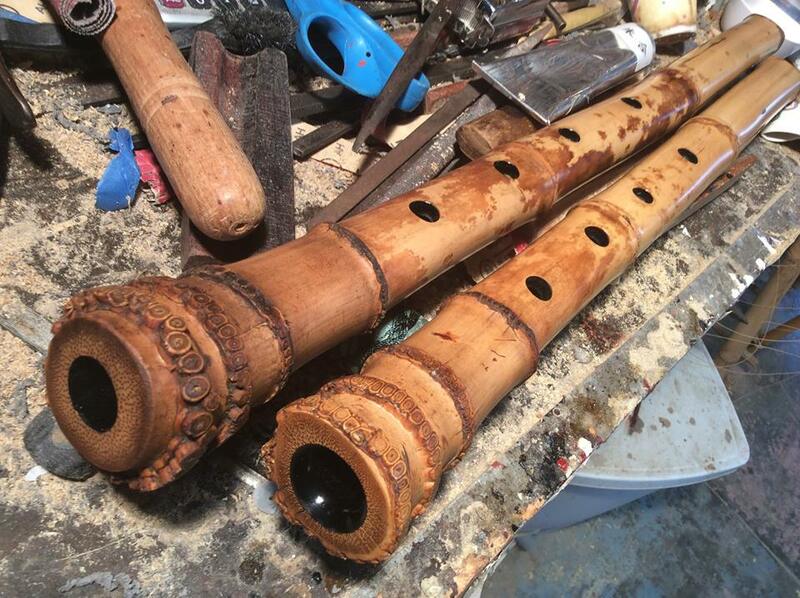 All flutes are meticulously and patiently adjusted until they are ready to be included here. The black or dark flutes which are occasionally included here are fashioned after some of the finer vintage Komuso flutes I've had the opportunity to play and study. The Komuso monks often painted the outside of their flutes with urushi, presumably to protect them from the elements. The black urushi surface is soft and velvety yet extremely durable. Also, check out other shakuhachi for lower priced flutes. I ask for full payment in advance of shipment (money orders, cashiers checks and PayPal orders only please) Upon receipt of payment, I'll ship the flute by USPS Mail. 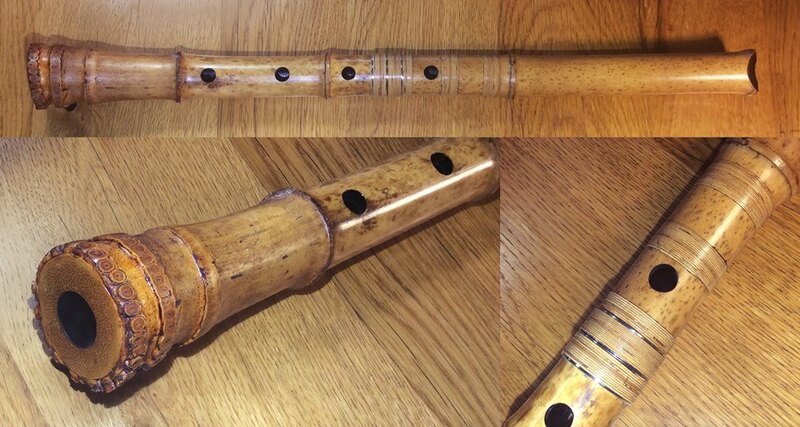 A full refund (minus shipping expense and Paypal fees - if any) will be given if you decide to return the flute (insured) in its original condition when received. Please let me know within two days upon receipt if you wish to purchase or return the flute. This auditioning policy does not apply to custom orders or shakuhachi with special requests. These sales are final. MU Shakuhachi are long, extra wide shakuhachi without holes! Made from the same bamboo as Taimu Shakuhachi, these flutes are made for low, breathy, meditative RO blowing and harmonics. 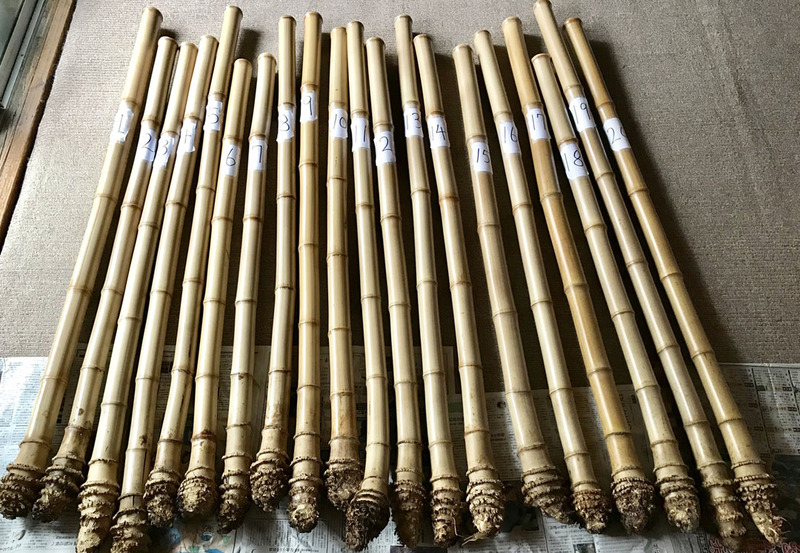 MU Shakuhachi are made to order and range in length from approximately 85cm. to 110cm. Diameters range from approximately 5.5cm to 6.5cm. MU Shakuhachi are available in two styles - Natural Bore and Urushi Bore/Urushi Stained Roots. $375 - Urushi bore and urushi stained roots. 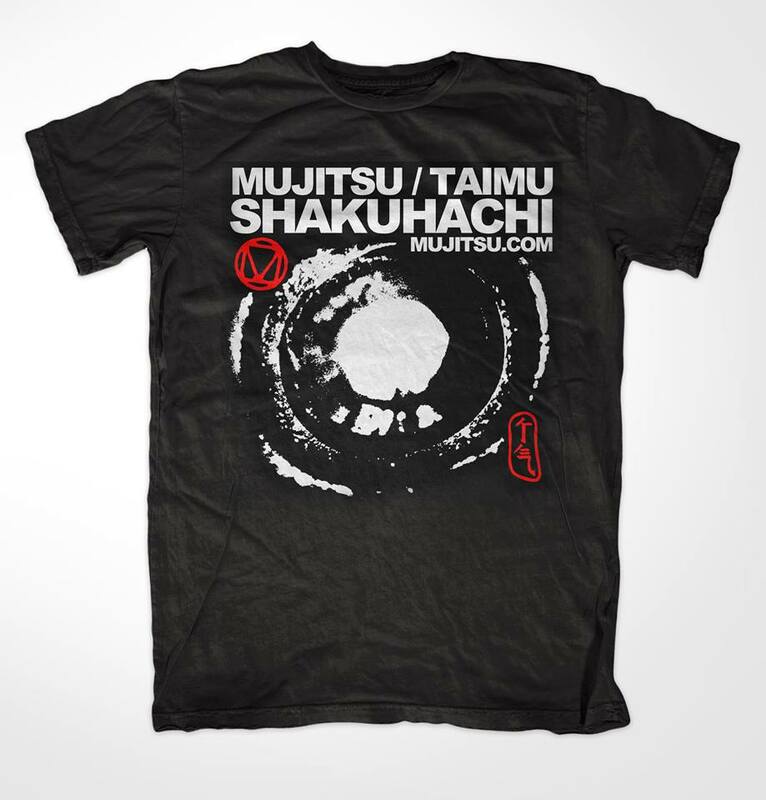 Mujitsu / Taimu T Shirts 100% cotton. Free shipping. Refurbished / Finsished, two-piece jinashi. This piece came to the shop in mid construction. Some bore adjustments and urushi finish work were done in the shop. Clear, clean, easy player. Urushi inside and out. $500 (Plus shipping) Please contact me for shipping charge and I will send you a paypal invoice. Characterized by a smooth, flexible, glowing foghorn tone. Slightly offset, angled holes. Can be played with fingertips or pipers grip. Smooth, flexible, glowing foghorn tone. Slightly offset, angled holes. Can be played with fingertips or pipers grip. Taimu Shakuhachi stock is in. Measured and ready to be made into new Taimu. It's a great batch this year. Excellent node spacing, thick walled and dense. These are real solid clubs. 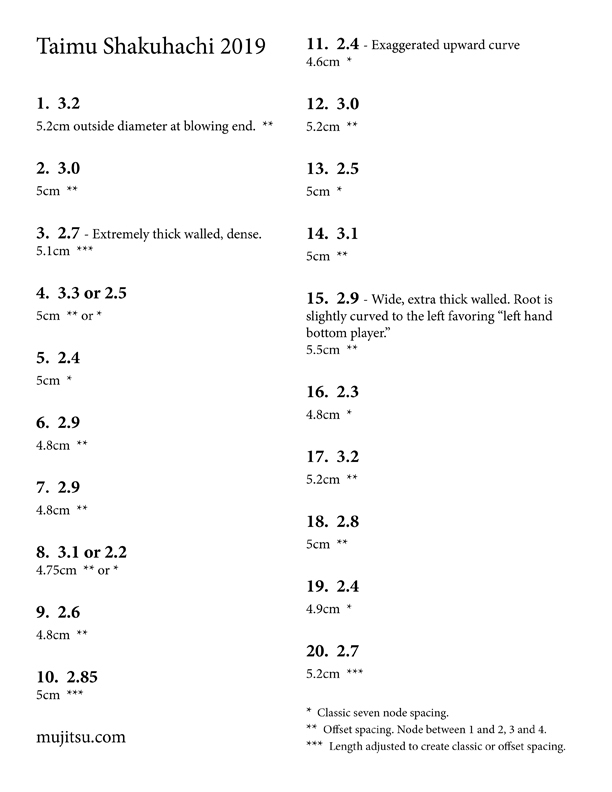 Sizes and notes on each piece are found below. To commission a particular piece or size please contact me. Prices for Taimu are typically $2,000 up to $3,000. This piece arrived at the shop in the first stages of construction. Originally intended as a jiari shakuhachi. Instead of coating the entire bore with ji paste, I spot toned it at strategic areas in the bore. Full, smooth volume, well balanced. Weight: 330 gr. Pitch: D @ 436. ID @ blowing end: 2.1 cm. OD@ blowing end: 3.6 cm. OD at root: 5 cm. Repaired surface crack above nakasuke. Slightly more focused tone. 45 year old Japanese madake bamboo. Balance of warmth and focus. Good volume. 45 year old Japanese madake bamboo. Slightly thinner bore. More focused tone. 45 year old Japanese madake bamboo. A very sweet player in a difficult, small size to make. 45 year old Japanese madake bamboo. Red urushi bore. 1.9 Mujitsu C/C# (Top left). 45 year old Japanese madake bamboo. Mujitsu 1.65 D# A wider bore Mujitsu shakuhachi made from 40+ year old Japanese madake. Open, airy, resonant tone. Outside diameter at blowing edge - 3.85cm. Inside - 2.2.